For the past four years, we’ve participated in the A to Z Blogging Challenge. 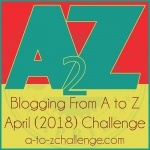 Starting in 2010, The A to Z challenge has grown to include over 1,000 bloggers. For our fifth year, we’re going to talk about our online courses designed for adults who have Down syndrome. The Road Scholars is a place where our community – adults with Down syndrome and the people who care for them – can come together and learn about topics that matter to them. We have both independent study (no set time frame) and more traditional online courses where students learn together on a specific timeline. Our April posts will highlight topics and activities covered in these courses. Thumbs up for choosing such a topic. We really need to highlight such areas of life and bring in light for everyone. Knowledge and love can help us fight with such syndrome. Loads of love and luck to you! !